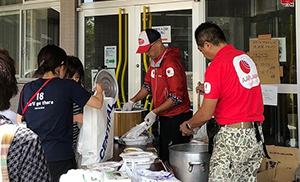 AAR Japan has been providing continuous relief assistance to the victims of the following disasters: torrential rains in the western Japan in July 2018, Hokkaido earthquake in September 2018, torrential rains in the northern part of Kyushu in July 2017, and the Kumam0to earthquake in April 2016. Immediately after these disasters, we started to provide victims with hot meals and distribute daily necessities and, while doing so, made sure that no People with Disabilities (PWDs), elderly residents or children were left behind. We are very appreciative of your generous support. The following is a report on how things stand in these areas. A big earthquake with a maximum intensity of 7 on the Japanese intensity scales hit Hokkaido in September 2018, with the central-eastern part of Iburi Subprefecture as its epicenter. AAR has been and still is supporting its welfare facilities in Mukawa town and Hidaka town respectively. The Hobetsu employment support center run by the social welfare corporation Aisei-kai (in Mukawa) owns a place called “Ryokuryu Aperasu”, where PWD are employed to grow and cultivate mushrooms. 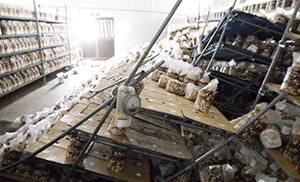 The earthquake seriously damaged the two rooms for mushroom cultivation, destroying the shelves where mushroom beds were installed as well as the ventilation systems. AAR is planning to help them with the installment of the new ventilation systems, but the contractors are still too busy to start it. Since mushroom cultivation requires a ventilation system to control the temperature and humidity, we are doing our best to start working for the restoration of the system. Kumamoto Prefecture and Oita Prefecture were hit by one earthquake after another in April 2016, with 270 casualties, including disaster-related deaths as of December 13, 2018, as reported by Crisis Management Division Kumamoto Prefecture. AAR Japan has been engaged in relief activities in the Minami Aso area, which was most badly affected. 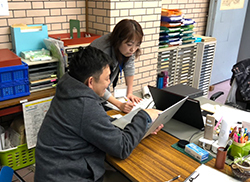 An NPO named “Minai Aso Ehon no Kuni” (in Minami Aso Village in Kumamoto Prefecture) has been actively engaged in activities using picture books led by Mr. Shomei Yoh (Director of Aso Highland Museum Park) and Mr. Shotei Hayama, who had their own library. After the earthquakes, children living in temporary housing units found it difficult to go to the library and enjoy reading picture books as they used to, which was why this NPO started a “mobile” library. This has helped children get over their stress. 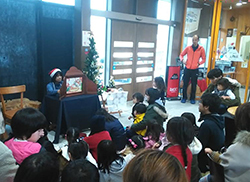 AAR Japan has helped the NPO start a traveling library by donating picture books, shelves and chairs. Please write down “Japan” and specify if you need a receipt.